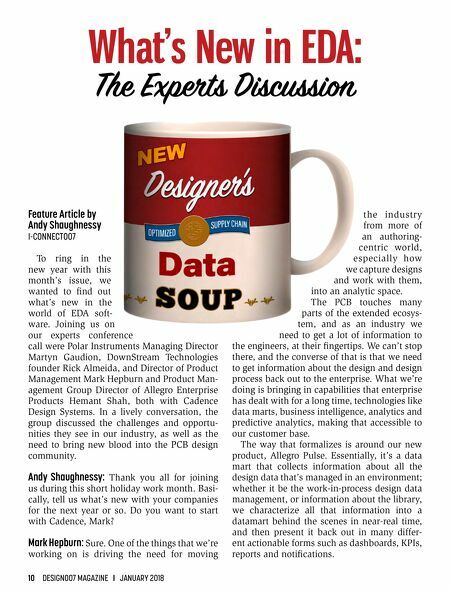 10 DESIGN007 MAGAZINE I JANUARY 2018 Feature Article by Andy Shaughnessy I-CONNECT007 To ring in the new year with this month's issue, we wanted to find out what's new in the world of EDA soft- ware. Joining us on our experts conference call were Polar Instruments Managing Director Martyn Gaudion, DownStream Technologies founder Rick Almeida, and Director of Product Management Mark Hepburn and Product Man- agement Group Director of Allegro Enterprise Products Hemant Shah, both with Cadence Design Systems. 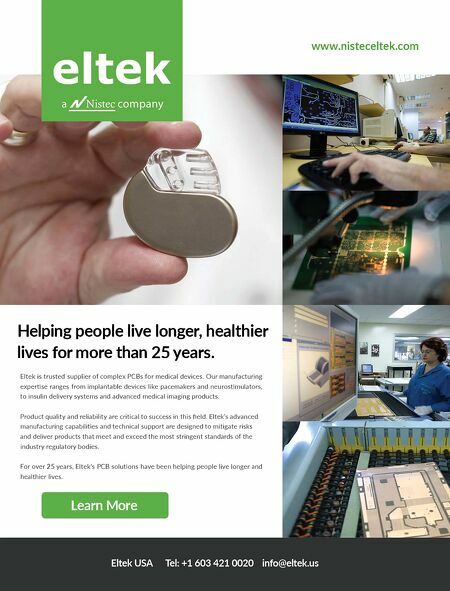 In a lively conversation, the group discussed the challenges and opportu- nities they see in our industry, as well as the need to bring new blood into the PCB design community. Andy Shaughnessy: Thank you all for joining us during this short holiday work month. Basi- cally, tell us what's new with your companies for the next year or so. Do you want to start with Cadence, Mark? Mark Hepburn: Sure. One of the things that we're working on is driving the need for moving What's New in EDA: The Expts Discussi the industry from more of an authoring- centric world, especially how we capture designs and work with them, into an analytic space. The PCB touches many parts of the extended ecosys- tem, and as an industry we need to get a lot of information to the engineers, at their fingertips. We can't stop there, and the converse of that is that we need to get information about the design and design process back out to the enterprise. What we're doing is bringing in capabilities that enterprise has dealt with for a long time, technologies like data marts, business intelligence, analytics and predictive analytics, making that accessible to our customer base. The way that formalizes is around our new product, Allegro Pulse. Essentially, it's a data mart that collects information about all the design data that's managed in an environment; whether it be the work-in-process design data management, or information about the library, we characterize all that information into a datamart behind the scenes in near-real time, and then present it back out in many differ- ent actionable forms such as dashboards, KPIs, reports and notifications.